New School for the Arts’ first graduating class in front of the original Scottsdale location. New School for the Arts & Academics (NSAA) founder Ron Caya had a vision: to open a high school that would give students an advantage in the arts with the primary goal of producing graduates who are prepared to enter the professional fields of art and education. It was very important to Dean Caya that NSAA build a faculty of professional artists to act as knowledgeable and highly-qualified teachers in order to inspire excellence from it’s students. He recognized that in order to develop a successful community, NSAA teachers needed to be among the best in their field and active artists within the community. NSAA’s teaching philosophy would place tremendous value in active, experiential hands-on learning and would focus on the integration of arts in the academic classroom. In 1995, Ron Caya’s vision became a reality, as New School for the Arts & Academics opened its doors in Scottsdale to its first class of young artists. 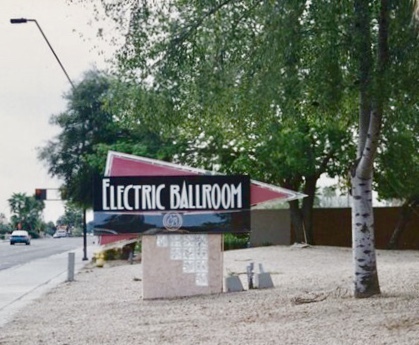 The iconic Electric Ballroom in Tempe, later to become the home of New School for the Arts & Academics. It didn’t take long before NSAA outgrew its original location, but where would we go? It was important to Dean Caya that NSAA’s new home embodied the unique, artistic spirit of its students and faculty, so when the facility that was once home to the Electric Ballroom (a local music venue which had presented many iconic artists of the 90’s) became available, it was a no-brainer that this should become the new home for New School for the Arts & Academics. In August of 2002, NSAA opened its doors, and for the first time in a long while, music & art once again fill the halls of this distinctive, charming building as students rehearsed for performances on the very stage where the likes of No Doubt, Weezer, Phish, Nirvana, and Iggy Pop had once played. After 9 years of operating a successful high school, Founder Ron Caya decided it was time to open a middle school with a quality and comprehensive arts and academic curriculum to feed into the high school; this occurred in 2003. The middle school physically joined the high school campus in 2005 and shares teachers and staff, which brings continuity between the two schools; however, the two charter schools are separate in some teaching practices, each school implementing methods conducive to the specific grade levels. Over the course of several years NSAA high school and middle school have progressed in state performance labels ranging from Performing Plus, Highly Performing and, Excelling based on the Arizona Department of Education criterion. NSAA's on-going goal is to continue meeting the excelling criteria of state and national standards, and to offer college preparatory courses as the founder and charter. An enormous part of our successful community relies on the NSAA faculty and staff. We take pride in hiring staff who are qualified teachers and professional artists. NSAA teachers are among the best in the field and continue to grow and develop according to the needs of the school and the community and evolve with the demands of teaching pedagogy and practices. Our students are privileged to have a diverse group of faculty and staff to support and guide them. NSAA is proud to participate in various Valley events and host community festivals to bring the community closer and provide exhibit and performance experiences for our talented artists. NSAA is recognized as an Arizona Civic Engagement School— School of Distinction— for making a difference in the civic life of our community and developing the combination of knowledge, skills, values and motivation to make that difference. Although NSAA has a teaching philosophy unlike traditional public schools, the requirements for public charter schools remain the same as for other public schools. NSAA must demonstrate progress from year to year in student achievement and growth, which is measured by a variety of data including attendance, performance on state testing and graduation rates. NSAA complies with all legislation, both federal and state, regarding the expectations and operating procedures of a public charter school. NSAA is obligated to fulfill the goals and items described in the charter contracts with the Arizona State Board for Charter Schools. If NSAA does not meet these requirements, funding and the integrity of the charter contract may be questioned and possibly revoked. In addition to the Department of Education and School State Board, NSAA must be in compliance with the AZ State Board of Charter Schools. NSAA is a member of the AZ Charter School Association and is accredited by AdvancED.